Seven days ago House Speaker John Boehner announced it was “time to deal” with immigration reform as he and other GOP leaders unveiled their long-awaited list of immigration reform principles, a move that signalled a willingness to pursue legislation this year. 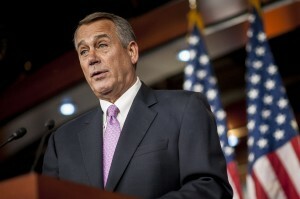 On Thursday Boehner said the House was unlikely to act until President Barack Obama earned the trust of GOP lawmakers. The turnaround comes as some conservatives have raised objections to moving forward with immigration reform at all, while others have cast doubts on the prospect the House and Senate could reach an agreement given their differences. The White House and congressional Democrats conceded Thursday the task of passing reform would not be easy, but said they remained optimistic it would ultimately get done. Sen. Chuck Schumer, D-N.Y., who helped craft the Senate immigration overhaul, said he agreed with Boehner’s assessment that it would be difficult. Sen. Robert Menendez, D-N.J., who like Schumer is a member of the Senate’s “Gang of Eight,” took a tougher line with Boehner’s comments. “No one said this would be an easy process, but it is irresponsible for Speaker Boehner and House Republicans to place blame on anyone other than themselves,” he said in a statement. The president and congressional Democrats have been willing to give Boehner and his fellow GOP leaders the space to figure out a path forward with reform. That window of opportunity could be closing, especially if Boehner continues to push the message that the president is the one to blame for holding up action. The Obama administration and congressional Republicans also remain at odds over raising the debt ceiling. Treasury Secretary Jack Lew has warned lawmakers that unless Congress votes to raise the debt ceiling the country could begin to default on its obligations by the end of the month. Even as some Republicans continued to hunt for one policy concession or another to demand from Democrats in exchange for lifting the ceiling, leadership has indicated it has no appetite for brinkmanship — particularly as Republicans head into a midterm campaign for control of Congress where they feel they have an upper hand, given the botched rollout of the Affordable Care Act and President Obama’s low approval ratings. And the White House has made clear that it has no intention of giving Republicans anything in exchange for increasing the limit. Speaker Boehner said Thursday his team had yet to finalize a strategy for negotiations on the debt limit, but said lawmakers would not miss the deadline. “No decisions have been made,” he added. Jay Carney reiterated Thursday that Mr. Obama would not make any concessions to Republicans in exchange for raising the country’s borrowing limit. “The president’s position is what it has been for a long time, which is that we are not going to pay ransom in return for Congress fulfilling this basic responsibility. So this is something that has to be worked out in Congress,” Carney said. On Thursday, however, two ideas gained traction, with dozens of Republicans predicting that versions of the pitches could hit the floor next week once House members return to Washington. At the top of the list: a proposal to link a one-year extension of the debt ceiling to a restoration of recently cut military benefits. Another popular option is tying the “doc fix,” which would alter the way doctors are reimbursed for Medicare treatments, to an extension. Changes to the federal budget that would reduce fraud or mandatory spending levels also have been mentioned. At a private lunch Wednesday, Boehner told a group of his loyalists that the military-benefits maneuver could force some Democrats to join Republicans and also win support from conservatives, who have voiced frustration with the reductions in payouts for retired military personnel. Those benefits were lowered in last year’s bipartisan budget agreement, which cut $6 billion in payments to veterans over 10 years. Boehner did not rule out a “clean” debt limit hike if Republicans are unable to unite behind a proposal. The speaker acknowledged that the issue would be a hard sell with his members. “You know, Mother Teresa is a saint now, but if Congress wanted to make her a saint, and attach that to the debt ceiling, we probably couldn’t get 218 votes for it,” Mr. Boehner said Thursday. And even if the speaker and his leadership team can find those 218 votes in the House for such a plan, getting that approved by the Democratic-controlled Senate is another story. For more background on the debate, the Washington Post put together a handy explainer of all the debt ceiling explainers. New Jersey Gov. Chris Christie traveled to Texas Thursday for a series of fundraisers for the Republican Governors Association, which he chairs. But two of the top Republicans in the Lone Star State — Gov. Rick Perry and Attorney General Greg Abbott — had no plans to meet with the embattled Garden State governor. While the GOP doesn’t seem in the mood to oust Christie as head of the RGA, the absence of Perry and Abbott signals that Republicans aren’t exactly eager to appear at his side. Democrats, however, are following his every step. The Texas Democratic Party chair trailed Christie’s visit, trying to compare Christie to Perry and Abbott. So why is he on the road at all? The Bergen Record’s Herb Jackson talks to out-of-state Republican strategists who don’t think “Bridgegate” will be all that bad for raising money. Christie, to people who would pay to hear him speak, is suddenly more interesting because he’s dealing with a crisis. “There may be a little car-wreck curiosity around this, and there may be money to be raised from rubbernecking,” University of Texas political scientist James Henson told Jackson. Back in the Garden State, however, Christie is getting more heat — this time for saying he knew nothing about a little-known bill that gives wide eminent domain powers to a higher education board in South Jersey. The problem: Christie signed the bill into law three weeks ago. He loved stories about politicians caught in a lie, and nursed grudges with sources who had lied to him. And he had a rule: Do not attack political operatives for doing stupid things, because they do what they do for their bosses, the politicians. Senate Republicans blocked Democrats from moving forward with a revised proposal to restore long-term unemployment benefits to 1.7 million Americans. The $6.4 billion cost for the three-month extension would have been offset by “pension smoothing,” which allows companies to use historical data to calculate pension contributions. Senate lawmakers voted 96 to 0 Thursday to confirm one of their own — Montana Sen. Max Baucus — to be the next U.S. Ambassador to China. The Washington Post’s Sean Sullivan looks at who might be appointed to replace Baucus, noting that all eyes are on Montana Lt. Gov. John Walsh. The Office of Congressional Ethics will continue investigating into March allegations that Rep. Cathy McMorris Rodgers, R-Wash., mixed campaign and official funds in a 2012 House leadership race. The OCE recommends that the House Ethics Committee conduct a full probe. Democrat Alison Lundergan Grimes holds a four-point lead over Senate Minority Leader Mitch McConnell in the latest Herald-Leader/WKYT Bluegrass poll of the Kentucky Senate contest released Thursday. A Quinnipiac University survey of the Colorado Senate race released Thursday found incumbent Democrat Mark Udall narrowly leading three potential GOP challengers. WMUR’s James Pindell reports Louisiana Gov. Bobby Jindal is heading to New Hampshire next month. Democratic strategist James Carville is joining Fox News. Sen. Chuck Schumer, D-N.Y., is fighting to make sure U.S. Olympians in Sochi get their shipment of Chobani Greek yogurt. Vice President Joe Biden loves Corvettes but is not too fond of LaGuardia Airport. Mr. Biden also told Time Magazine’s Zeke Miller that the Obama administration is not pushing marijuana legalization at the federal level. The NewsHour kicked off its “Closing the Gap” series this week, asking lawmakers how they will address growing economic inequality. Rep. George Miller, D-Calif., co-sponsor of the bill to raise the federal minimum wage to $10.10 an hour, spoke with Judy Woodruff Wednesday. Millions of dollars are already pouring into the campaign to control the Senate. Matea Gold of The Washington Post joined Judy Woodruff to discuss how money could affect the midterm elections. Jeffrey Brown spoke with filmmaker Greg Whiteley about his Netflix documentary, “Mitt,” which provides a close-up look at the former GOP presidential candidate and his family over the course of two campaigns. Today reaffirms my belief that, if 2016 doesn't work out, VP Biden's reality show will just obliterate any ratings competitors. Bridget Bowman and Ruth Tam contributed to this report.